Your brother is the reason you smile, and he is the one who always makes you feel protected. But, have you ever expressed your love for him? So, send him a gorgeous rakhi with chocolates on Raksha Bandhan and thank him for always being there for you. Raksha Bandhan, or essentially Rakhi, is a Hindu festival celebrated in India and Nepal, it signifies "obligation of security". The celebration praises the adoration and obligation amongst brothers and sisters. Sharing sweets and rakhi gifts are the most exciting part of this festival. With time, sweets have been replaced by Chocolates, as chocolates are famed for their exquisite taste and texture. With their rich symbolisms and universal popularity, chocolates make perfect gifts. A gift consisting of a gorgeous rakhi and chocolates is probably the best gift that you can give to your sibling on Raksha Bandhan.Thus, gifting chocolates for Rakhi to your brother will be a great idea to celebrate the occasion and infuse sweetness into the day as well as the relationship. So, if you are seeking for the best rakhi chocolate gift hampers in India then, look no further because FlowerAura is the right place. We, at FlowerAura, have brought to you wide assortment of online rakhi with chocolates that are sure to please your brother taste buds. On the auspicious occasion of Rakhi, you must be reliving so many moments that you and your brother together had. Since childhood you have celebrated this festival together with your brother and this day has added to the loving bond of affection you and your sibling hold. Now that your brother is far away in another city you cannot afford to make him sad on the day of rakhi. 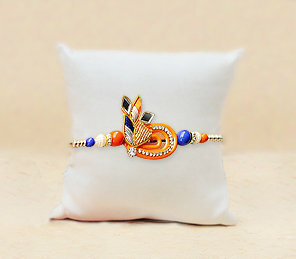 Send rakhi gifts to Faridabad online for your brother to make him forget the distance between both of you. Surprise him by sending a rakhi with chocolates out there in the city and if you are late, then the benefit of same day chocolate rakhi gifts delivery and instant services offered by Floweraura is available for you. So, send chocolate gifts for Rakhi to your brother and sweeten your bond with him. Yes, now with FlowerAura, you can send rakhi with chocolates for your brother and make him feel pampered. Almost everyone gives sweets but the charm of chocolates never ceases. And surely you and your siblings will be having those chocolate snatching sessions. Your brother too must be having that particular favorite chocolate he adores. So let him relive those moments by sending amazing gift of chocolates along with Rakhi. We have a wide variety and combination of chocolate and Rakhi on our online portal. We have assorted handmade chocolates, Nestle chocolates, Ferrero-Rocher, Dairy Milk, Lindt, Hershey's and dark chocolates as well. And you will be allured to see how we have added the creative touch to each of the collection. They are ornate in the most exquisite boxes decorated with traditional as well as modern touch you can choose according to your taste. So, if you are looking for the most delicious chocolate boxes for rakhi then, just visit our website and buy chocolates for Rakhi. Apart from the exclusive range of rakhis and delicious chocolates, you can also order a meaningful gift for sister on Rakhi from us and make her feel special. All you have to do is to go through FowerAura's online web portal & buy rakhi with chocolates to ensure a million dollar smile on your brother's face. We, at FlowerAura, will make sure that the chocolate rakhi hamper reaches your brother on time, of course we have free home delivery services. We at flower assure you the best services and if you got late in placing the order, don't worry, we have options such today delivery. We have a wide reach from north to south so, You can and also you can send rakhi gifts to Chennai, we deliver Rakhi chocolates in India which includes more than 180+ cities and our service includes free shipping as well.